“KT” (above) and Hunter (below), with a couple nice & feisty Muskegon river fall steelhead.Many battles, lots of jumps and a LOT of fun !…thanks fella’s ! 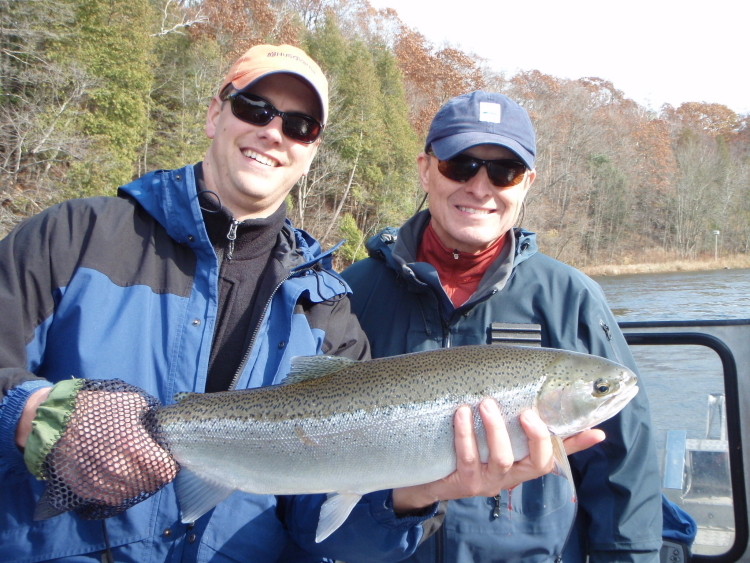 ….Could be the largest river rainbow I’ve see on the Muskegon river in 15 years of guiding…..what….a….fish ! Jason (orange hat) and Chuck (blue hat), both from west Michigan, with absolute “bullet” fall steelheads…..”acrobatic river artists” is what we’ll call them ! Semi-annual Father-Daughter outing for the Katie & George V, from SE Michigan. Classic “mix” of weather for us…..a mix or rain, snow, wind…..but the fish didn’t seem to mind !